London, UK – Legendary John Wetton, best known for his work with Asia, UK and King Crimson, is releasing two new albums this month: The Studio Recordings Anthology 2CD Set and New York Minute – John Wetton & The Les Paul Trio, on Primary Purpose via Cherry Red Records. As a singer, bassist and songwriter, John Wetton initially rose to fame as the lead singer of King Crimson and thereafter Wetton formed UK with Eddie Jobson and later he was the lead vocalist of the supergroup Asia, his biggest commercial success. The band’s self-titled debut album was the biggest selling album in the world in 1982. Wetton also has a successful solo career releasing a large number of studio and live albums and these are showcased on the 2CD ‘The Studio Recordings Anthology’ meanwhile a unique live album with The Les Paul Trio includes a number of songs Wetton has never sung elsewhere. 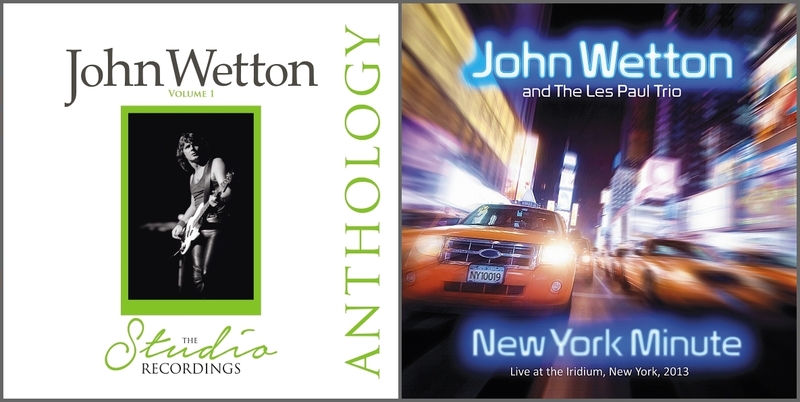 The Studio Anthology collects together the best of John Wetton’s six solo studio albums within a 2-CD set with extensive new liner notes. 4. WHERE DO WE GO FROM HERE? 13. WHO WILL LIGHT A CANDLE? New York Minute sees John Wetton playing a selection of the songs that inspired him, many of which are not available on any other release. This new live album also includes unique renditions of his solo hit BATTLE LINES and the ASIA mega hit HEAT OF THE MOMENT. John Wetton is embarking on a number of live projects in 2015 including the final tour of UK and a German ‘Rock Meets Classic’ orchestral arena tour. This entry was posted on Monday, March 9th, 2015 at 21:23	and posted in John Wetton, Press Release. You can follow any responses to this entry through the RSS 2.0 feed.